On the face of it, a charcoal grill can be a little bit utilitarian. You dump some charcoal into the bottom of the firebox, light it up, and toss food on the grates to sear it and cook it to the ideal temperature. It’s a wheel that’s hard to innovate with fancy gimmicks and attachments. Taken in this context quality and convenience become key characteristics that matter. Still, a little touch of innovation is nice, especially if it’s geared toward helping with a charcoal grill’s biggest detractor, the cleanup! 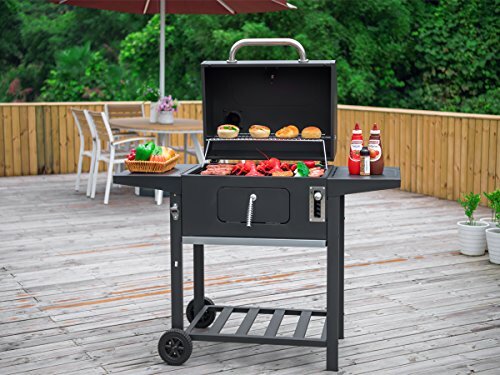 The Royal Gourmet CD1824AC 24 Inch Charcoal Grill certainly ticks all these boxes. It is made from durable high-quality materials. It has sound welds and even has a heavy duty lid for maximum heat retention. It comes with two folding side tables, that are available in spaced wooden slats or as solid metal. The benefit of the wooden slats is that excess rainwater won’t pool on them if the grill is left outside without a cover. The Royal Gourmet CD1824AC also has a little innovation to it with its adjustable charcoal pan, which allows you to lock the height of the charcoal pan at one of six different heights. 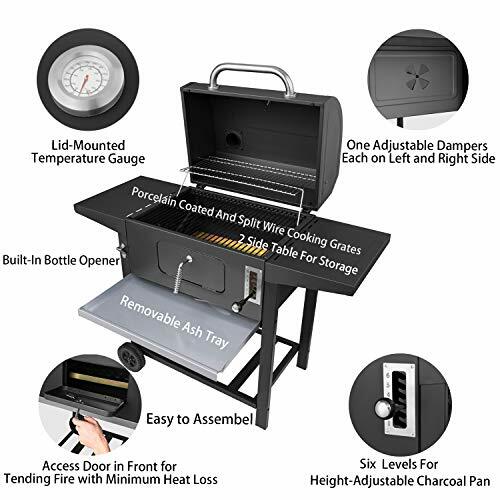 This is often preferable to a grill with a crank style adjuster, which has a tendency to gum up with ash or jam when you are grilling in cold weather. The adjustable charcoal pan allows you to do something like put a perfect sear on a steak for 30 to 60 seconds on the highest setting. You can then drop it down to the lowest or second lowest setting for two minutes. Then flip, raise the charcoal pan again for another great sear. Then drop it back down again for another three minutes, and you will have a steak that is grilled to a perfect medium rare, with a beautiful and delicious crust. The charcoal pan has large holes in the bottom, which help with the passage of air, and a more efficient, high-heat burn. 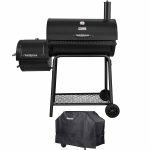 The Royal Gourmet CD1824AC also has a heavy-duty front access door, that allows you to add more charcoal or wood chips, in the middle of a long grilling session. This grill was also designed with a pull out as pan. Any ashes that escape down the holes, can easily be disposed of. The Royal Gourmet CD1824AC is made from high-quality steel, with durable welded joints, and strong fasteners. The square tube legs of the cart are secured to the base and joined together at the bottom with a basic storage shelf for superior stability. With some basic mechanical skill and a basic box of tools, you should be able to assemble it in a little over an hour. The side shelves can be a little tricky to install, so that the fold down easily, yet hold in securely when locked in place. The Royal Gourmet CD1824AC has some definite strengths, but there are also a few places where they missed out on an opportunity. On its highest setting, the charcoal pan can deliver a nearly steakhouse quality sear. Yet on its lowest setting, it still gives you the ability to grill slow and low. The porcelain coated grill grates provide you with more than enough space to grill supper for a family of four. Yet it’s not quite big enough to serve as an improvised smoker. 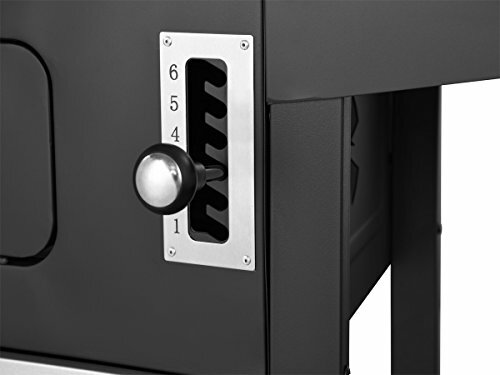 At the same time, the selector handle allows a lot of excess air into the firebox, which can lead to increased problems with flareups as well as some heat control issues. Another minor area where Royal Gourmet missed the mark, is by not offering as an accessory rotisserie. It actually has enough space under the domed hood to accommodate one, with a little improvisation. Another minor complaint, that may or may not matter depending on how the type of charcoal you use, is the size of the holes in the charcoal pan. They are the perfect size for large charcoal briquettes. However, lump charcoal tends to pass right through them, leaving only the biggest pieces behind, and a whole lot of smaller unburned pieces in the ash pan. While you could use jumbo lump charcoal to get around this, there will still be some pieces and dust that go to waste down in the bottom. If you are a lump charcoal purist you might want to place some welded wire construction mesh in the bottom to help catch medium to small pieces of lump charcoal. 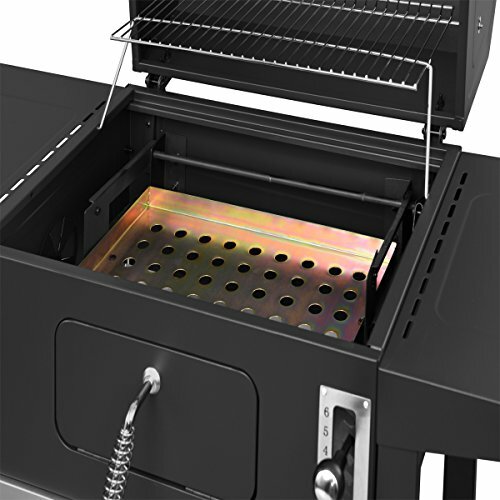 The porcelain coated, cast iron grill grates in the primary grilling area provide 393 square inches of cooking space. Which is more than enough to cook for a family of four, or even to grill hot dogs for the neighborhood block party. 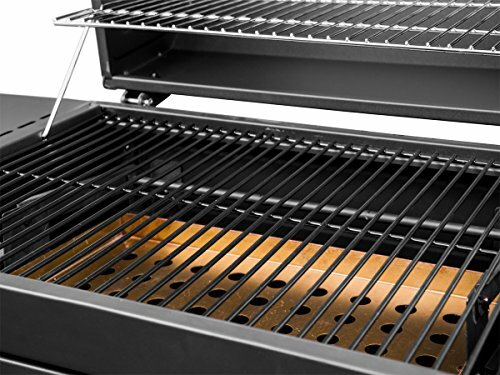 The Royal Gourmet CD1824AC also has a 205 square inch warming rack, which is pretty spacious for a grill this size. With a little bit of trial and error, you could potentially use the upper warming rack to some a rack of spare ribs. Just make sure you dial in the heat. 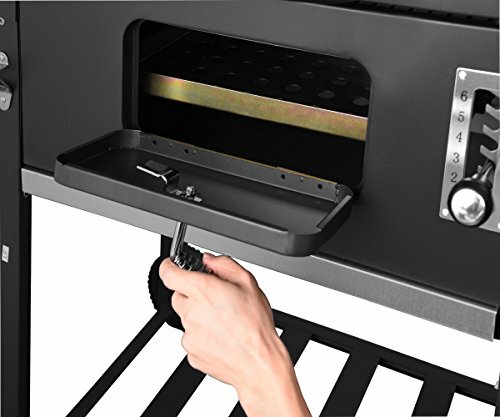 The adjustable charcoal pan allows you to alter the relationship between the fire and the food being grilled. The folding side tables help with storage on a deck or patio with limited space. The pull out ash collection pan helps with cleanup. 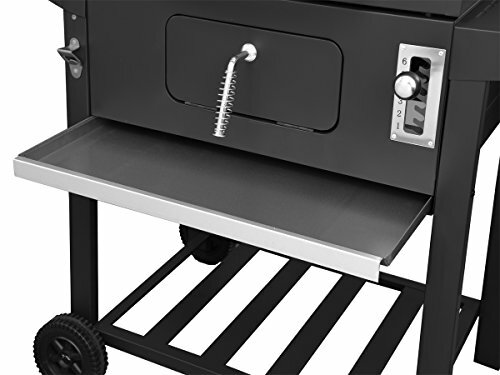 The front access door allows you to reload charcoal and wood chips or to stoke the fire. 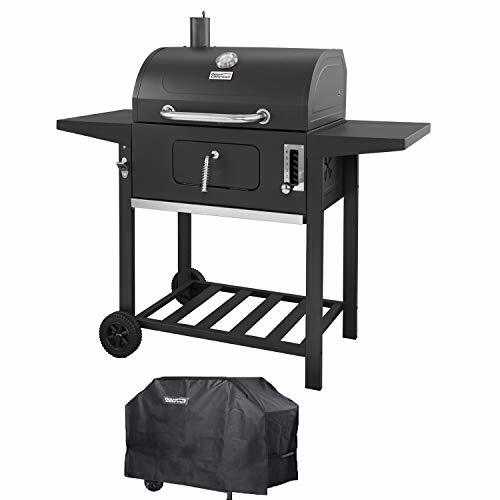 The Royal Gourmet CD1824AC is relatively easier to clean than most traditional charcoal grills. It comes with an ash collection pan that pulls out. One thing to keep in mind is that at a certain point, you pull it out far enough, and it will try to dump down. If you’re not careful about this, you could end up with an even bigger mess on your deck, and a pair of white shoes that will never be the same again! The cast iron grill grates help prevent drippings and things like excess marinade from sticking. If something is stuck so bad that your grill brush can’t clean it, the grates can be removed and soaked in warm soapy water to release it. The Royal Gourmet CD1824AC comes with a basic one year warranty. 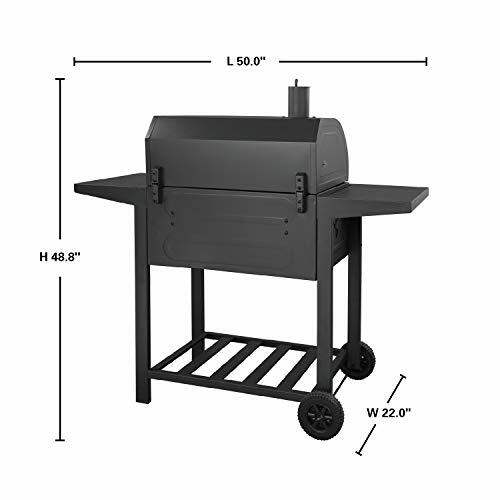 If you want a charcoal grill that blends a little versatility with quality and sturdy construction, the Royal Gourmet CD1824AC will certainly fit the bill, with a nice price point. 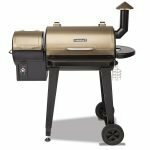 Just don’t expect it to serve double duty as an improvised smoker and watch out for the hair trigger ash collection pan!